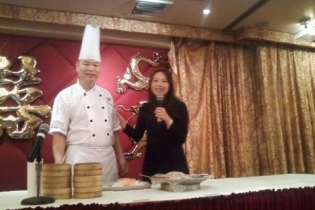 Went to tasting at the Golden Unicorn to meet Ching-He Huang and see her new EAsy Chinese Everyday cookbook. Delicious food that you eat at breathtaking speed. What I like particularly is taht you fill up fast but by the time you’re home, you are too tired from going to Chinatown to consider getting more food. Easy on the budget, easy on the belly. Ms. Huang’s folding of the dumplings was a sculpture’s dream…easy pleating of the dough creating wonderful pocketbooks for sumptuous insides. And all this as Andy Lee, filmmaker, was just landing in Shanghai.